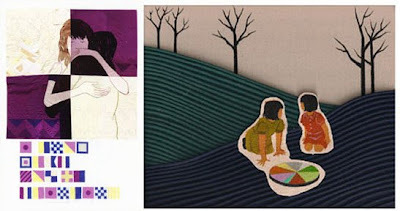 3 wonderful artists have (had) their opening of their "I Know What You're Thinking" show tonight at Sloan Fine Art in New York City. 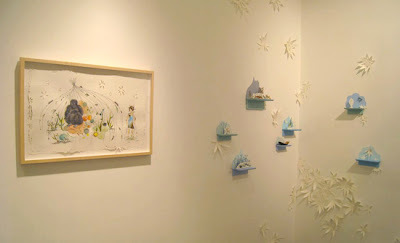 I have been a fan of Caroline Hwang since I saw her show at Giant Robot here in San Francisco a couple of years ago. We were looking to buy one of her pieces but it was sold at a previous show so that was a bummer. 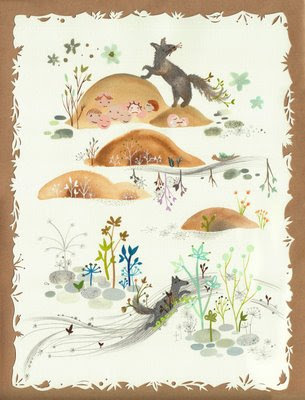 I have not heard of Seonna Hong prior to learning about this show but looking through her work, it looks like it is right up my alley. I am loving the little girls in her Viscery Loves Company series. And of course, I am already a fan of Saelee Oh ever since I bought the Jill Bliss/Saelee Oh calendar in 2007. Look at the painting she did on her dad's laundry mat. I think it's lovely! Maybe this'll make me do more laundry. Maybe. If you're in the area, this is definitely a must see!